This celebrated woodcut records the arrival in Lisbon of an Indian rhinoceros on 20 May 1515. The ruler of Gujarat, Sultan Muzafar II (1511-26) had presented it to Alfonso d’Albuquerque, the governor of Portuguese India. Albuquerque passed the gift on to Dom Manuel I, the king of Portugal. The rhinoceros travelled in a ship full of spices. On arrival in Lisbon, Dom Manuel arranged for the rhinoceros to fight one of his elephants (according to Pliny the Elder’s Historia Naturalis (‘Natural History’) (AD 77), the elephant and rhinoceros are bitter enemies). The elephant apparently turned and fled. No rhinoceros had been seen in Europe for over 1000 years, so Dürer had to work solely from these reports. He has covered the creature’s legs with scales and the body with hard, patterned plates. Perhaps these features interpret lost sketches, or even the text, which states, ‘[The rhinoceros] has the colour of a speckled tortoise and it is covered with thick scales’. 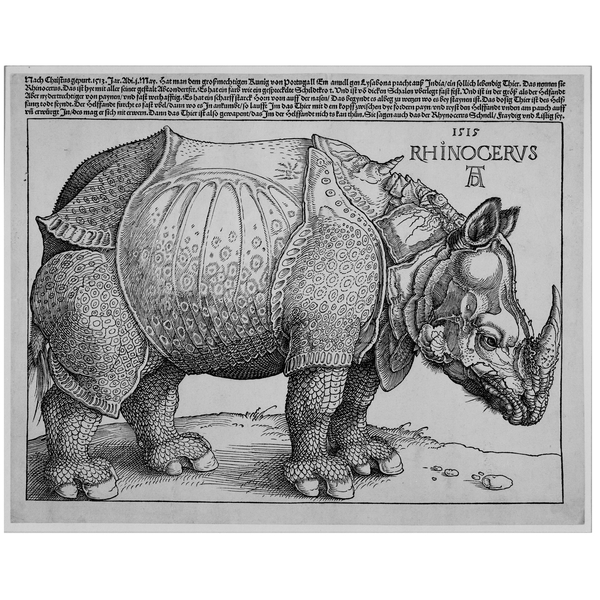 So convincing was Dürer’s fanciful creation that for the next 300 years European illustrators borrowed from his woodcut, even after they had seen living rhinoceroses without plates and scales. Dom Manuel sent the rhinoceros to Pope Leo X in Rome, who had much admired ‘Hanno’, the elephant the king had sent him the year before. Sadly, the ship carrying the new gift sank before it reached Rome. Via British Museum. In 1515, he created his woodcut of a Rhinoceros which had arrived in Lisbon from a written description and sketch by another artist, without ever seeing the animal himself. An image of the Indian rhinoceros, the image has such force that it remains one of his best-known and was still used in some German school science text-books as late as last century. Via Wikipedia.